CEDAR CITY – The American Red Cross, in partnership with the Utah Medical Association Foundation, will be facilitating free informational workshops for health care professionals throughout Southern Utah. The next workshop will serve the Iron County area and is scheduled for March 22, from 9 a.m. to 12:30 p.m. in the education classroom on the campus of Valley View Medical Center, located at 1303 North Main Street in Cedar City. Refreshments and lunch will be served. Licensed health care workers will be introduced to the concepts and procedures of how to manage health care needs in Red Cross emergency shelters, including performing health assessments, disaster triage and responding to public health emergencies in the community. Retired health care workers are also encouraged to attend. This is an introductory workshop, and more information on becoming a Red Cross volunteer will be provided. 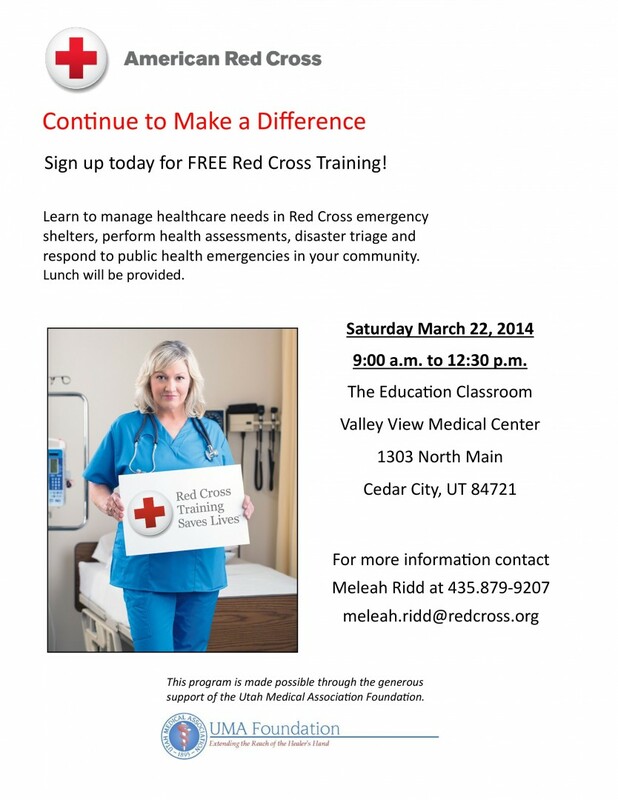 For more information or to RSVP, please contact Meleah Ridd at 435-879-9207 or meleah.ridd@redcross.org.